Convertro, one of AppsFlyer's integrated partners, strives to be the leading automated tool for marketers to truly understand the performance of their advertising choices and activate upon these insights as quickly as possible. They've built a technology that not only gathers granular information about the customer path to conversion, but is also able to scientifically optimize marketing mix and automatically understand how to shift spend to maximize ROI. Enter "Convertro" in the search field and click on its logo to open the Convertro configuration window. The Convertro configuration window only makes use of the Integration tab. Convertro connects with AppsFlyer via a unique Page URL, Site ID and Client Name. If you don't already have them, you must obtain them from Convertro to continue with the integration or follow the instructions below. AppsFlyer can send automatic postbacks to Convertro user installs. Use this section to define sending these postbacks. 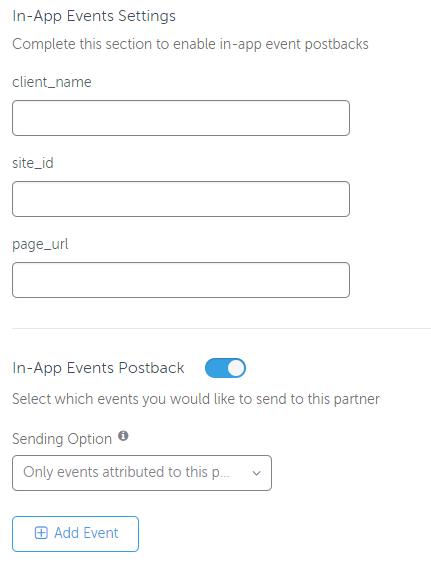 Select Events attributed to any partner or organic to send postbacks for any user that downloads the app to Convertro or select Off. In this section you can map your AppsFlyer events with Convertro via postbacks. Enter the Client Name, Site ID and Page URL again. Partner Event Identifier The unique name or ID of each event as defined on Convertro's side. Obtain the corresponding Event ID from Convertro and set in the text field. Tracking Links are not available for Convertro. Permissions are not available for Convertro.